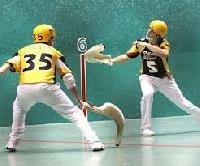 During Jai Alai game the competition is between two man teams (doubles) or between single players (singles). Every player (or a team) has an assigned number from 1 to 8. These are the same numbers, which the public makes bets on. By the obvious analogy with the greyhound starting boxes, these numbers are also called post positions. 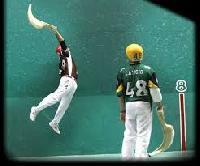 According to the rules, the participants of the Jai Alai matches are chosen by players manager and the matchmaker. The purpose of that rule is to assure a competitive game interesting for the public and fair for the players. The matchmaker plays a role similar to the role of racing secretary who plans horse and greyhound races that would make a competitive sense. 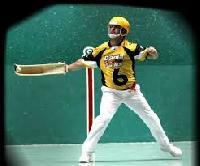 A players manager can manage a group of few dozens of players at the same time and at the same fronton. A manager tries to take care equally of the interest of every player in the group. Each point is started by serving the pelota (ball). The server must bounce the ball behind the serving line, and, with the cesta, hurl the ball directly to the front wall so that upon rebound it will bounce between lines No. 4 and 7. If it does not, it is an under or over serve and the other team will receive the point. The ball must be caught on the fly or first bounce. The ball, also, must be caught and thrown in one fluid motion. The judges will rule juggling if the ball pops up or if it is held for more than the required time. All three walls are in play the red is out of bounds. In Spectacular Seven/Nine scoring point value is 1 until each team has played once, thereafter point value is double. 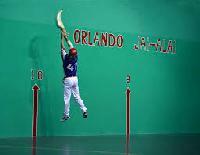 Like handball or squash, Jai Alai players share the court with the opposition. If a player blocks another's line to the ball on the catch or to the wall on the return, the judges may rule interference if they deem that the ball was playable. Most games are played to 7 points with points doubling after the first round of play (called Spectacular Seven) scoring. The game is played in a round robin rotation, usually by 8 teams or single players. In doubles, each team consists of a frontcourt player and a backcourt player. The game begins when the frontcourt player of Team No. 1 serves the ball to Team No. 2. The winner of each point stays on the court to meet the next team in rotation. Losers go to the end of the line to await another turn on the court. The first team to score 7 points (or 9 in Superfecta games) wins. The next highest scores are awarded place (second) and show (third) positions, respectively. Playoffs decide tied scores. After a Winner has been declared, play off rules to decide place, show and fourth positions, vary according to the number of points scored by the participating players or teams, and shall be played according to the players or teams ROTATION POSITION (not Post Position), i.e., the order in which they were defeated. IN CASE OF A TIE after a Win position has been officially declared, it shall not be necessary, in order to determine place, show or fourth positions , or all three for the players or teams to score the full game's number of points. WHEN THERE STILL REMAIN FIVE OR SEVEN PLAYERS OR TEAMS, all of which are tied without a point to their credit the play off shall be for a goal of one point less than the number of post positions represented in the play off. After a Winner has been declared official, and there are still two players or teams tied with the same number of points, the Place position shall be awarded to the player or team making the next point, and Show position goes to the loser of said point. (a) Two ties remain after Win and Place have been determined, the Show position shall be awarded to the player or team making the next point and Fourth position shall go to the loser of said point. (b) Two ties remain after Win, Place and Show have been determined, the Show position shall be awarded to the player or team making the next point.